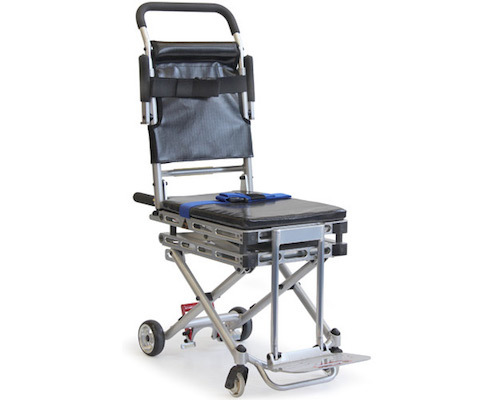 The Melrose Folding Aisle Onboard Lift Wheelchair has been specially designed to fit down narrow aircraft aisles and then raise the seat up above the aircraft seat armrest to allow easier access to disabled passengers. The seat lift uses scissor lift technology to allow flight attendants to easily hoist the passenger from 480mm up to 660mm. The armrests, footplate and restraining straps all move with the seat making the transition easy and safe. It will also fit into tight spaces like non-disabled public toilets, bus aisles, caravans and anywhere else a standard wheelchair might not fit. This model folds down to only 350mm height, 745mm length and 390mm wide so it can be stored in tight spaces. A single pin locks the legs into place as you unfold it, while two pins lock the back into place. Armrests fold down, these can help to provide lateral trunk support as well as the chest strap. We can also provide quotes for bulk orders.